Interested in Continued Summer Development? Check out our Summer Skills page here! 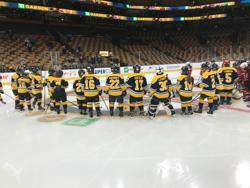 NHE's Squirt 3 team recently visited TD Garden and had the opportunity to play a game on the Garden ice and watch the B's take on the Winnipeg Jets. Sounds like it was an awesome time!!! Thank you to the Boston Bruins for this awesome opportunity. It is with profound sadness that on behalf of the Board of Directors, I reach out to you. On December 30, 2018 we lost a former NHE coach and Board member Steve Chenard. Steve, passed away unexpectedly while on vacation with his family. Steve always put the interests of the children first, whether on the bench or participating in our Board discussions. Steve also regularly volunteered at the Greater Seacoast Salvation Army in Portsmouth. At age 49, he leaves behind his wife Kim, and children Griffin, Ethan, and Julia. We will be making a donation in memory of Steve to the Salvation Army, and encourage anyone who remembers Steve to do so as well to: https://nne.salvationarmy.org/seacoast-nh/ or by mail to Greater Seacoast Salvation Army, 15 Middle Street, Portsmouth NH, 03801. On January 11, 2019, we were notified that Paul Comeau, NHE’s Director of Hockey also passed away suddenly. I simply can’t put into words what this means to our program. Paul lived and breathed youth hockey and was the lifeblood of our organization. In addition to being an original founder of NHE, Paul managed the day-to-day operations of the organization through-out his tenure. He was a coach, referee, scheduler, formerly served as NHE President, and was the current president of New Hampshire’s USA Hockey Affiliate New Hampshire Amateur Hockey Association. He shared his love of hockey with his wife Robin, and sons Matt, Tony, and Eric. As you can imagine, Paul’s passing leaves a significant void in our organization. 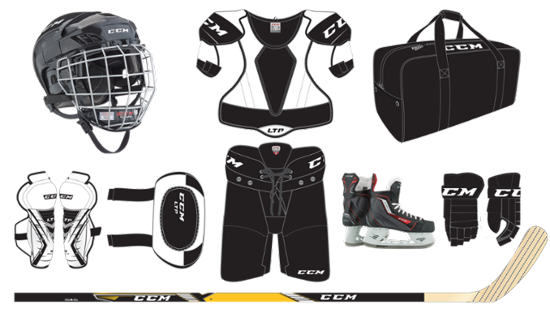 We have contacted all of the NHE head coaches and will be working with them over the next few weeks to ensure that the season continues uninterrupted, and that the Board provide the necessary resources to the coaches, players, and parents for another successful year of hockey. Paul would have wanted nothing less than for us to commit all of our resources to finishing this year and preparing for next season. All we ask is that you be patient with us as we make this transition. The outpouring of emotions and support that we’ve received over the last two days, shows exactly the impact that Paul has had on our lives and ultimately proves that NHE was his legacy. Parents, coaches, state officials, youth hockey organizations, regional and national USA Hockey executives, our vendors, and other entities have all offered condolences, but most importantly, a commitment to helping NHE and lending any support they can provide. Although we have lost a very important part of the NHE family in Paul Comeau, with your continued support and understanding, we will get through this challenging time. The youth hockey community is strong, and more importantly, the NHE family remains resilient. As we transition, if you need anything, please feel free to contact me directly at myoung@LTCPartners.com or 603-498-5863. NH East is excited to announce our Learn to Play Hockey program beginning on 12/9. The program will run for ten (10) weeks and will feature outstanding instruction from Certified USA Hockey Coaches. The sessions will take place on Sunday mornings beginning December 9th at 8:45-9:45 am and continues for ten consecutive weeks. This program is open to boys and girls ages 5-9. The cost of the program is $199. Any questions please call 603-814-9383. NH East currently has openings for USA Hockey Officials for the 2018-2019 season. We offer excellent game times and pay rates. Please contact us at doh@nheeagles.com if interested. DID YOU KNOW THAT OUR WEBSITE PLATFORM HAS A MOBILE APP? SportsEngine, the platform that the Eagles site runs on, has a great mobile app, available for both Apple and Android devices. The app allows players, coaches, and parents to stay up to date with scheduled games and practices, score updates, news articles, and more. The app is free and can be downloaded on both the Apple and Android platform. Once you've downloaded the app on your device, it's time to add your team(s) to the app. To do this, navigate to your child's team page. Atop each page, in the top right, is an icon that has a Team ID located above the words Share this Team. Once you have the Team ID, open the app on your device. Click on 'Team' icon and then the "search" icon. Enter in the Team ID. Then click on the team name to add it to your device. That's it! If you have more than one child in the program, repeat the above steps for each team. You can change the settings in the app to get as many or as few notifications as you'd like. NHE would like to recognize and congratulate our 8 alumni who were recently selected to the New Hampshire High School Hockey All-State Teams: Ben Baldasaro (Exeter), JoJo Grella, Patrick Vetter, Keegan Youngclaus and Chris Eno (Saint Thomas Aquinas), Fred Holmes (Portsmouth/Newmarket), Luke LeBlanc (Sanborn) and Carissa Towlson (Exeter Girls). Additionally, congratulations to Keenan Gamache and Mark Engholm from York HS in Maine on being selected to the Maine Class B All State Team and Senior All Star Team respectively. NH East is accepting applications for Coaching positions for the 2019-2020 season. Applications can be submitted for Head and Assistant Coaching positions. If you have any questions please contact Cam Stoddard, NH East Director of Hockey. Registration for the 2017-18 Bruins Academy Learn to Play Hockey program will open on AUGUST 2, 2017. Click HERE to register. Make sure you select the NH East session at Phillips Exeter Academy. Members of the NH East Eagles Pee Wee 1 Hockey Team captured the Boston Bruins – TD Garden Mini 1 on 1 Tournament on December 3, 2016 at the TD Garden in Boston, MA. The tournament features 3 on 3 mini-games with a goalie that last 3 minutes each. If the teams remain tied after regulation, the game goes to a sudden death shoot-out to determine a winner. The Eagles eliminated Westfield MA in the first round 1-0, advancing to a quarterfinal shoot-out win over the Maine Moose. NH East then went on to defeat the Manchester NH Flames in a semi-final shoot-out win, and edging Duxbury MA in the finals in yet another shoot-out win! Team members that took part in the victory run include Henry Fraser, Keegan Knight, Ty Robinson and Shauna Vadeboncoeur. The Eagles will have their hockey program and team name engraved on the Boston Bruins – TD Bank Mini 1 on 1 Cup; the team will attend an upcoming Bruins game with a player meet and greet; and then be featured during an intermission of a future Bruins game. Congratulations Eagles! Pee Wee 2 Win Tourney in the Woods! The PW 2 captured the championship of the Tourney in the Woods held in Groton MA. 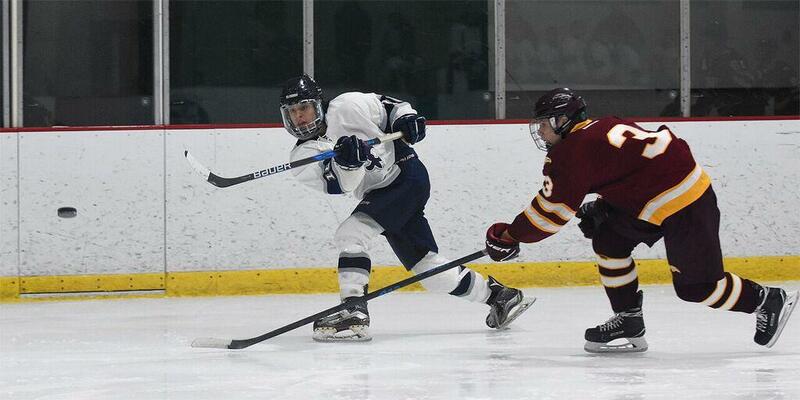 Both Dylan Knizak and Tyler Dickson scored goals in two games and Trey Marcotte was solid in goal for the Eagles. The team was unbeaten in the tournament, winning the Championship game 3-2 against a tough NE Stars squad which they had tied earlier in the tournament.